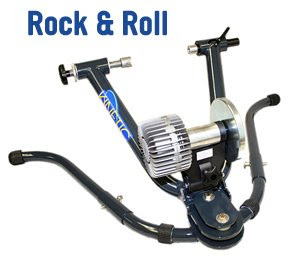 I'm not really sure whether the Kurt Kinetic trainer will roll, but they sure are heavy as rock. With almost 30 kgs under with the bigger 12 lb flywheel, there's no excuse NOT to do strength training for back and shoulder or save money on dumbells. But its nice to talk about a solid design like Kurt's. Again, this post is rolling off a recent article from Cycling News. 1 : Color - They no longer have the old metallic grey color. This is a nice green. I'm young and I certainly want colors around me to reflect that. Oh c'mon, there must be more to this color change idea. What do you think? Most of those industrial machinery are a dull green, so is this to reflect the sturdy, powerful design? 2 : Magnetic Coupling - This is cool. 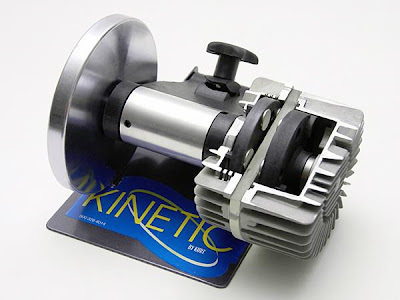 Instead of directly connecting the drive shaft to the impeller that will then rotate in the 'thermodynamically' stable fluid called silicone (popular breast implant material), they use magnetic coupling to connect the roller torque with the resulting shaft torque in the fluid chamber. 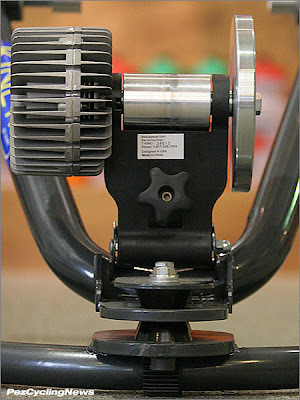 The fluid chamber is separated from the roller chamber with the help of a glass like material. 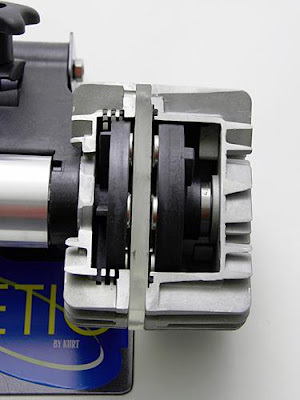 Such a gap with magnetic coupling has the potential to reduce vibration, wear and noise. What that claims to do is eliminate chances of O-Ring failures and messy fluid leakages. 3 : Wide Base - Any solid structure should have a good base. With 120cm wide stability, this baby is an all encompassing beast. 4 : Rock and Roll Motion - A unique rock and roll motion is given to this trainer with the help of flexible rubber cones at the lower base-upper carriage junction. 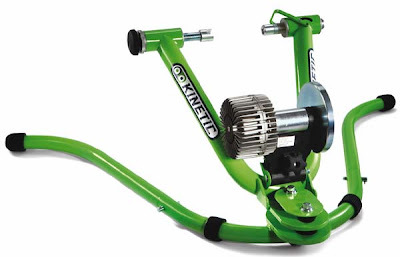 Kurt Kinetic trainers are solidly built with a robust, durable design and a realistic ride feel. 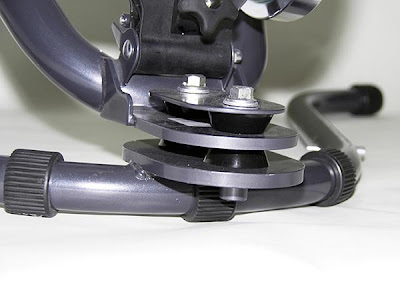 However, in this quest for 'realism' ( however you want to define it), a question that has passed my mind is this : Why don't trainers have larger roller diameters? Perhaps the roller-tire interface can be made more like a road-tire interface, with less amount of tire digging into the roller? Moreover,why can't a roller be made to mimic a more natural material like that of road asphalt instead of aluminum alloy, which is seldom the case for road biking? That'd be pretty cool, look wise and feel wise since there could theoretically be less tire slippage and could near the rolling resistance co-efficient of actual road. The idea I'm sitting on is to lessen the rolling friction because a major by-product of this tire-roller interaction is heat. Okay, its been a long day. I'll be racing this weekend, and doing a small training camp next week so expect little posts for 3-4 days. Enjoy! I have been thinking of getting a trainer to drag to races for warming up. At 30kg, I am not going to consider this one. That is almost ridiculous. I bet it rides smooth though with such a heavy flywheel.